Ken Mehlman is a long-time Republican campaign operative who worked as chief of staff for Congresswoman Kay Granger, and was on the staff of Rep Lamar Smith. Mehlman worked on election campaigns in Georgia, Massachusetts, Ohio, Texas, and Virginia, on the losing Presidential campaigns of George H.W. Bush in 1992 and Bob Dole in 1996, and on George W. Bush's campaign in 2000. Under the younger Bush, Mehlman was White House political director from 2001-04, where he reported directly to Karl Rove. He was campaign manager for Bush-Cheney in 2004, and became Chairman of the Republican National Committee in January 2005. When scandals began swirling around lobbyist Jack Abramoff, Mehlman said he did not know Abramoff well. Abramoff, though, said Mehlman had been a guest for Sabbath dinners at Abramoff's house, and performed political favors for him. Vanity Fair reported that Mehlman's office made a special effort "to keep Abramoff up to date on issues related to his clients". While Mehlman ran the Republican National Committee, it spent $2.5-million on the legal defense of James Tobin, a New Hampshire Republican operative who was convicted of jamming phone lines of the Democratic Party's get-out-the-vote effort in the 2002 election. Tobin's office made 22 calls to the White House during the two-day illegal phone jamming operation, mostly to a number that rang on Mehlman's desk, but Mehlman has denied that any of the calls had anything to do with the phone-jamming operation. In David Kuo's book Tempting Faith, the author, a Christian activist, alleged that Mehlman orchestrated a systematic campaign to divert funds budgeted for the Bush administration's "faith-based initiatives" for political purposes instead. He supported virtually every anti-gay legislative act over decades, including the 2005 Marriage Protection Amendment and Republican-backed voter initiatives against gay rights in 21 states. Mehlman came out of the closet as a gay man in August 2010. His father, Arthur Mehlman, was a partner at the auditing department of the international corporate services corporation KPMG. 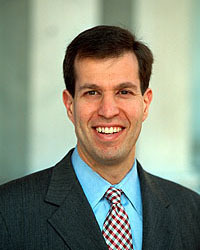 His brother, Bruce Mehlman, was briefly Assistant Secretary of Commerce for Technology Policy, then co-founded the lobbying firm of Mehlman Vogel & Castagnetti. When queried, "[You] have asked a question people shouldn't have to answer." Mehlman was widely rumored to be gay, but denied this, and complained that "those stories did a number on my dating life for six months." On 8 November 2006, Bill Maher claimed on Larry King Live that Mehlman was gay. CNN edited the allegation out of subsequent rebroadcasts and the program's transcript, and two days later Mehlman announced his resignation from the RNC, effective January 2007. In 2010, Mehlman had a change of heart. Marc Ambinder, "Bush Campaign Chief and Former RNC Chair Ken Mehlman: I'm Gay", The Atlantic (blog on the magazine's website), 25 August 2010, quoting Mehlman: "It's taken me 43 years to get comfortable with this part of my life... Everybody has their own path to travel, their own journey, and for me, over the past few months, I've told my family, friends, former colleagues, and current colleagues, and they've been wonderful and supportive. The process has been something that's made me a happier and better person. It's something I wish I had done years ago."